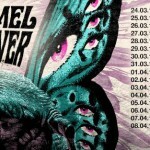 CAMEL DRIVER is a three piece instrumental rock band from Kiel, Germany. Founded in 2012, they made their way through various stages in the region/area to become a respected live band. With an induvidual approach they combine finest desert rock sounds with raw metal influences and fine-tuned/hot oriental jazz parts. Inspired by the instrumental power of several bands, CAMEL DRIVER has gone deeply into versatile songwriting to create their own colorful and massiv sound landscapes!